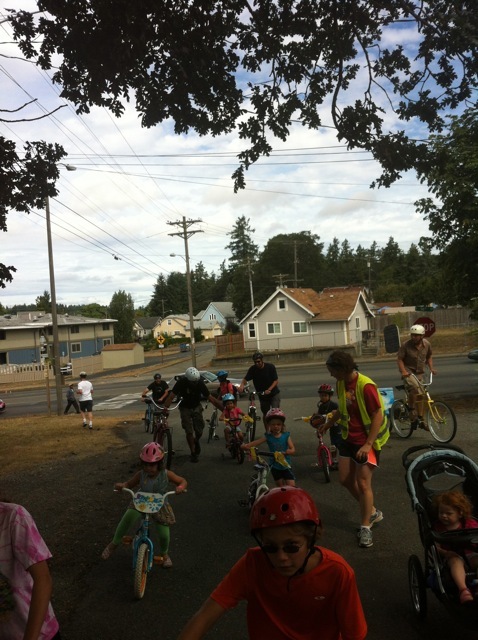 Our fourth Kidical Mass of the summer happened on Saturday. Five families met at South Park for a ride on the Water Ditch Trail, which winds through the South Tacoma neighborhood. 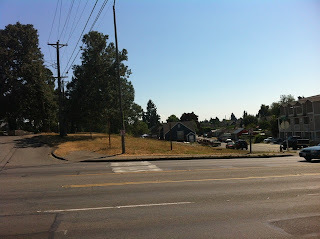 Before we started, I scoped out the street crossing at South 56th, the only major arterial on the trail. 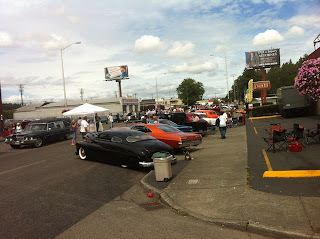 To my surprise I found a huge car show taking up 6 blocks of nearby South Tacoma Way. 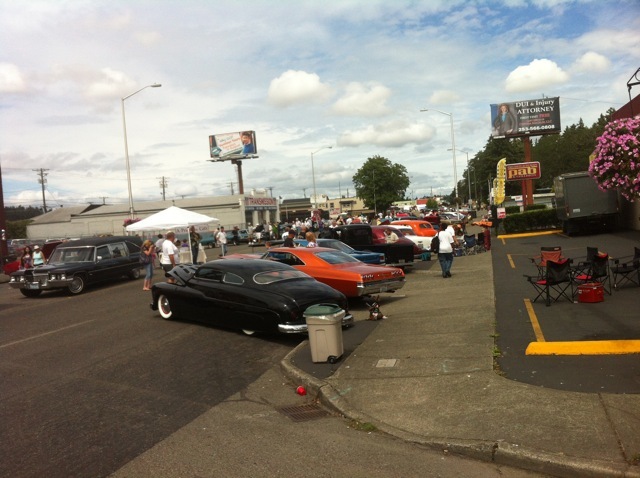 The car show was easily drawing 10 times the normal Saturday morning traffic and the road closure was causing backups and parking issues near the trailhead at South Park. 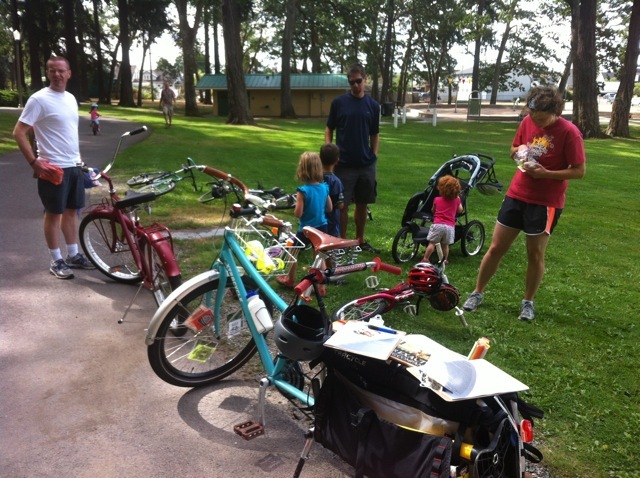 While the kids decorated bikes, the pedal parents discussed how we'd handle the traffic. There is signage expressly prohibiting pedestrian crossings where the Water Ditch Trail meets 56th Street. Rather than navigate our 15 bikes several blocks up the sidewalk to the traffic signal, we simply waited for a gap and blocked traffic for a minute. 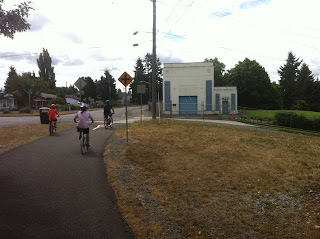 It worked OK.
After we crossed and walked up this short incline, we were rather unencumbered for the rest of the ride. 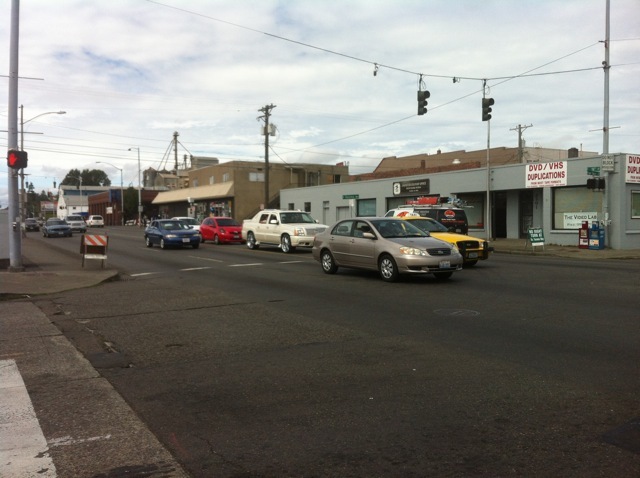 There are many small residential street crossings, which gave us opportunities to practice Watch for Cars and Look Both Ways. Our destination was Arlington Elementary, where one of our riders had just graduated from preschool. She was excited to tell us about her field trip to Northwest Trek and how she'd be attending kindergarten at Edison Elementary next month, a school which we also rode by. 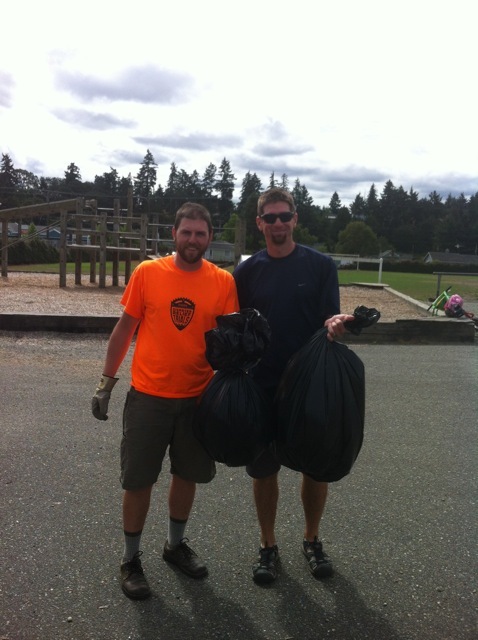 With conviction and maybe even pride, she told us, "I live in South Tacoma." She seemed tickled to be sharing her neighborhood with us. At Arlington we spent 15 minutes picking up litter from the playground and the ball field. Kids and pedal parents were more than happy to pitch in. 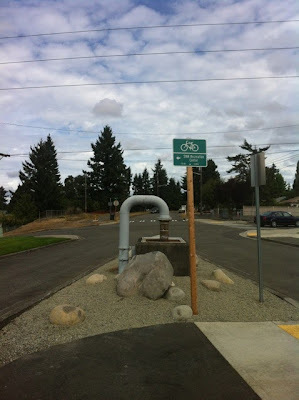 Knowing the afternoon traffic would be heavier, we left the trail and dropped down to Puget Sound Avenue just before 56th Street so we could cross at a traffic light. It was a good choice. Big kids took the lane and younger riders took the sidewalk for the last six blocks back to the park. 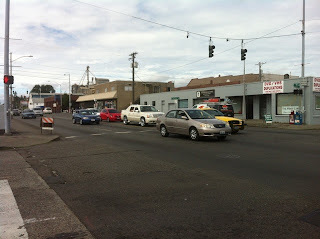 Traffic was heavy, but everyone did a great job of sharing the road. 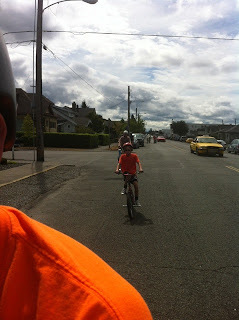 At this point I felt the whole group was riding with a poise and confidence that we lacked at the beginning. They made it look easy. As usual, Jeff's Ice Cream rode along and handed out frozen treats to all of our riders at the finish. 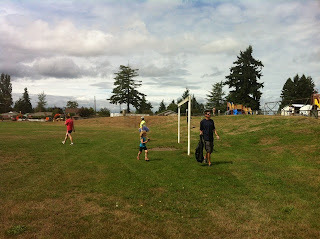 South Park is truly a gem of the South Tacoma neighborhood and worth checking out. 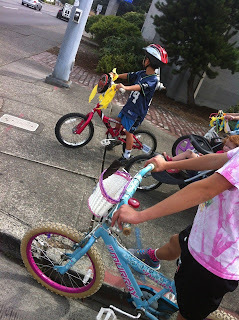 Thanks again to the Tacoma Wheelmen's Bicycle Club for supporting Kidical Mass. 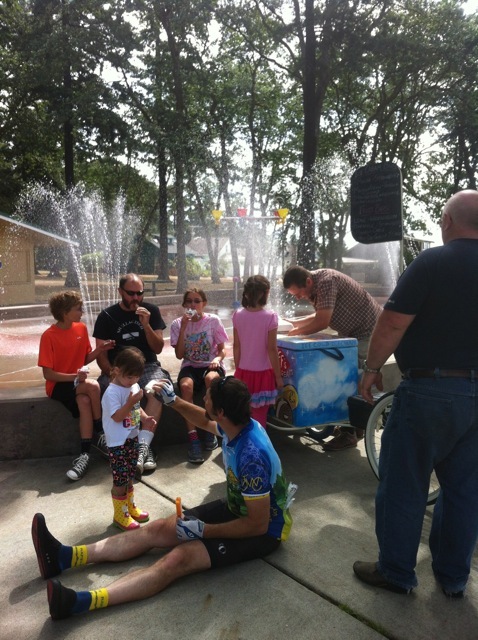 Our next (and final) ride of the summer, will be on September 22 as part of Metropark's Downtown to Defiance: Sunday Parkway event. 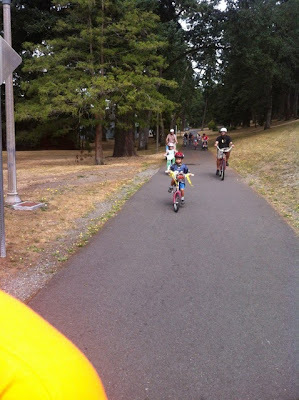 Kidical Mass will start at 11am from the Point Defiance Park entrance (look for a special bike corral.) More details will be posted here soon. Mark your calendar!